The name given by Herod the Great to a fortress on the north side of the Temple at Jerusalem. It formed a projection on the northwest, so that it was not till it was destroyed that the Temple area became a square (Josephus, "B. J." v. 5, § 2 and vi. 5, § 4). According to the historian, the circuit was large enough to enclose broad spaces for quarters for troops, with courts and baths resembling a palace. These courts adjoined the north and west cloisters of the outer enclosure of the Temple. There were four corner towers, and the main citadel, on a lofty scarped rock, was said to be 50 cubits high. The corner towers were of the same height, but that on the southeast, rising from lower ground, was 70 cubits high. A deep ditch separated the fortress from the hill of Bezetha to the north ("B. J." 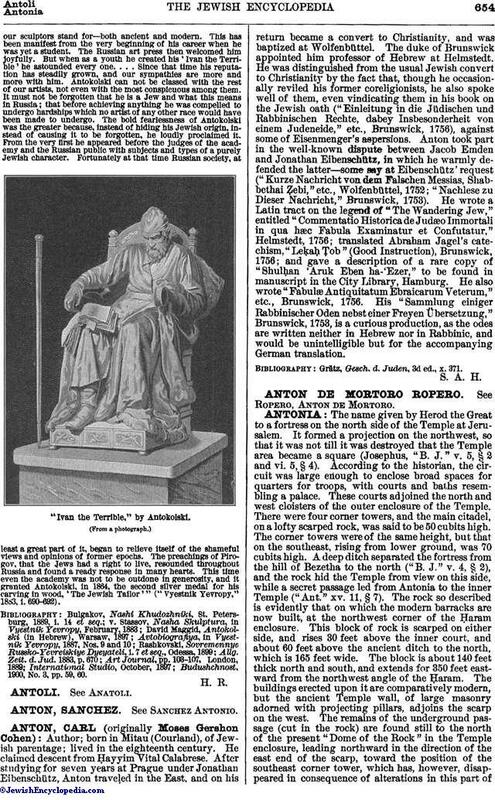 v. 4, § 2), and the rock hid the Temple from view on this side, while a secret passage led from Antonia to the inner Temple ("Ant." xv. 11, § 7). The rock so described is evidently that on which the modern barracks are now built, at the northwest corner of the Ḥaram enclosure. This block of rock is scarped on either side, and rises 30 feet above the inner court, and about 60 feet above the ancient ditch to the north, which is 165 feet wide. The block is about 140 feet thick north and south, and extends for 350 feet eastward from the northwest angle of the Ḥaram. The buildings erected upon it are comparatively modern, but the ancient Temple wall, of large masonry adorned with projecting pillars, adjoins the scarp on the west. The remains of the underground passage (cut in the rock) are found still to the north of the present "Dome of the Rock" in the Temple enclosure, leading northward in the direction of the east end of the scarp, toward the position of the southeast corner tower, which has, however, disappeared in consequence of alterations in this part ofthe Ḥaram. The entire area of Antonia appears to have been a quadrangle of about 500 feet north and south by 350 east and west, or four acres. Though rebuilt and perhaps enlarged by Herod, this citadel had existed much earlier. The Birah belonging to the Holy House (Neh. ii. 8) was probably a "fortress"—according to the Aramaic and Assyrian meaning of the word—rather than a "palace," and the corner towers, Hananeel and Meah, are mentioned to the north of the Temple (Zech. xiv. 10, Neh. iii. 1, Jer. xxxi. 37). Josephus ("B. J." i. 3, § 3) gives the name Baris to the fortress which preceded Antonia on this site; and in the Mishnah (Mid. i. 9; Tamid, i. 1; Zeb. xii. 3) the Birah is noticed, with the passage leading to the gate Ṭadi on the north side of the Holy House. This Birah was fortified by the Hasmoneans (Josephus, "Ant." xv. 11, § 4) and became the palace of John Hyrcanus ("Ant." xvii. 4, § 3). The northwest corner tower seems to have been known, rather later, as Strato's Tower ("Ant." xiii. 11, § 2; "B. J." i. 3, § 4), and here was a narrow underground passage in which Aristobulus was killed. This may be represented by the rock-cut passage leading from the ditch northwest of Antonia, which now ends at the Ḥaram Wall built by Herod, and probably once communicated by steps with the interior of the Antonia courtyard, south of the great scarp above described. The ditch existed at the time of Pompey's siege ("B. J." i. 7, § 3), and was artificially cut through the hill (v. 4, § 2). It was partially filled in by Pompey ("Ant." xiv. 4, § 3), and at the present day the street runs over the "Twin Pools," which appear to have been built in the foss after Hadrian's rebuilding of Jerusalem—the modern level being some 40 feet higher than the bottom of the ditch. 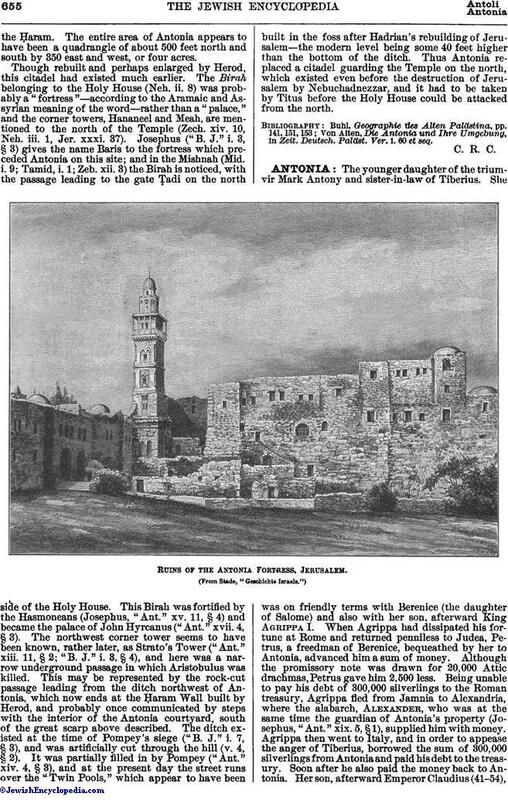 Thus Antonia replaced a citadel guarding the Temple on the north, which existed even before the destruction of Jerusalem by Nebuchadnezzar, and it had to be taken by Titus before the Holy House could be attacked from the north. Von Alten, Die Antonia und Ihre Umgebung, in Zeit. Deutsch. Paläst. Ver. i. 60 et seq.